The three days after leaving Hammerfest were among the toughest and most rewarding of the journey so far. I set off from the dock beside Hurtigruten’s idling MS Kong Harald, with a crowd of 40 waving me off. 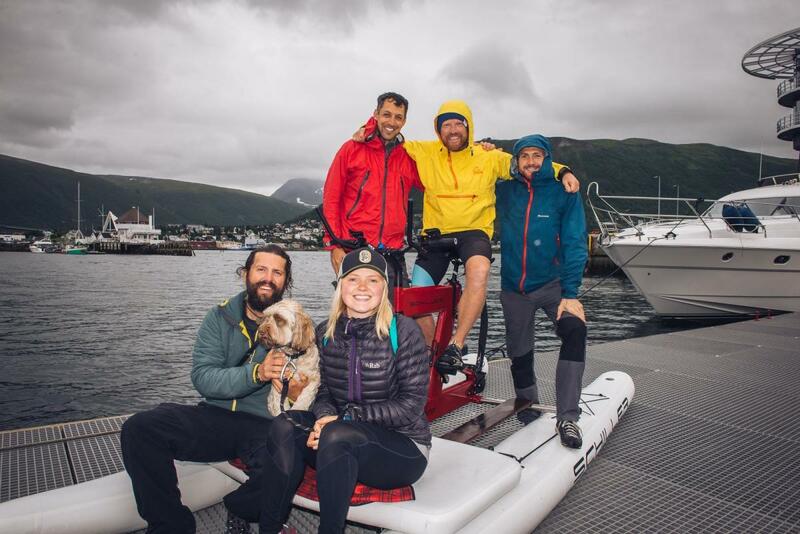 I can’t explain the feeling of gratefulness I have with such support, especially from enthusiastic strangers, and little did I know in a few days time that the Kong Harald would provide one of the moment’s of the trip. I am largely alone on this journey, there’s arguably too much time to process information but I have friends to share it with, often in the form of puffins who gather in the centre of the biggest channels, sometimes in pairs and sometimes in groups of up to 100. It says so much about Finnmark that I’ve seen more puffins than humans since arriving in Norway, and their wonderfully confused paddling style sends them in zig zags as I approach, before they opt for their last resort: to dive out of site. They’re just lovely and dappy and make me giggle out loud. I spent my first night out of Hammerfest some 35 miles west, making camp on a beach comprised of huge boulders. The tide was low, always the worst time to land, and it took over half an hour to haul my Schiller Bike towards the high tide mark, ensuring that the lapping water wouldn’t steal my steed as I slept. The effort aside, making camp in a remote spot is a glorious feeling. I am king here, just for a night, and my tipi is my castle. I pitch on the sand, using head-size boulders instead of pegs, then build a fire and clear part of the beach of driftwood, always leaving a little in case the next water biker comes along and needs some warmth. The next day I am in a fight with the wind. The Schiller Bike is stable - I’d take it over a kayak in open water - but the going is slow and tough. Endurance journeys are physical, of course, but it’s 90% a mental game. In the middle of a channel, sometimes 10 miles from the nearest land, I have nothing to gauge my speed with. It is a game of trust, just keep the wheels turning and eventually, however long it takes, you’ll get there. And there, of course, is unknown. I have never been here before, and it is that golden promise of uncertainty that drives me on. This was my hardest day on the water. Waves covering me each second, soaked to the bone, cold to shivering with just endless cycling to keep me going, but the ending was worth it. 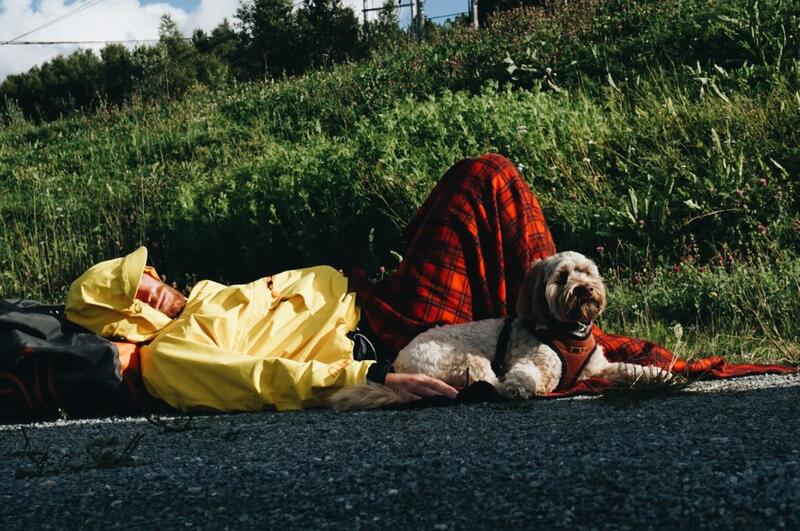 I reached a small village called Bergsfjord hidden down the bottom of a gorgeous, wave-filled fjord, and tucked into a pontoon, relishing the calm I hadn’t seen all day. A white van was up on the road waiting for a ferry, and I saw the driver incredulously taking photos as I approached. I’m used to this, a water bike is a rare species up here. One hour later I find myself in the driver’s front room, which also happens to be a cafe in the village store, which he runs. A plate of veggies and wild salmon is kindly thrust into my hands, and then a beer. Oh my, this is amazing! Strangers are just friends waiting to happen, and Roar, my new friend, is one of those angels that so often appear in the midst of an adventure. There is something wonderful about travelling slow, moving with a story and a natural ice-breaker, and with the vulnerability you only have when you don’t have a place to stay. Humans are at their best in these situations, especially far away from cities, and Roar is the perfect example. After food he walks me around his store picking out chocolate and energy bars from the shelves, with each one looking at me with a grin and the words, ‘Will this take you further?” So, so kind. I spend the night in the village ferry terminal, a habit that I believe is now going to be become regular on this trip. ‘Of course you can sleep there!’ everyone says, as though I’m crazy for even asking. Imagine that kind of open doors policy in the UK?! The next morning I’m joined by a pod of 12 small whales, who breach alongside for half an hour before going on their merry way. I love being so high up out of the water, with the extra views this affords. A special time indeed, to be graced with presence of the locals. Three nights and 100 miles later I pitch camp on an island after another day of headwinds and views that will never stop astounding. Today is special. As Arctic Terns territorially dive-bomb as I scoop away sheep poop before pitching the tipi, I keep an eye on the horizon. It’s rare that anyone actually travels alongside me on a trip like this, but on this occasion my friends Andy and Chris have made the journey to Norway, and after flying into Tromsø they’ve paddled (one in a kayak) and pedalled (the other on a second Schiller Bike) 15 miles north to meet me in this gorgeous spot. I’m glad to see them and grateful that now the Arctic Terns have some other targets, and we catch up around a camp fire as the biggest moon I’ve ever seen rises to the North, above fjords and mountains. Three and a half weeks earlier I’d flown into Tromsø then jumped aboard Hurtigruten’s MS Finnmarken for an enjoyable 34 hour journey north and east to Kirkenes. It has taken me all of three weeks to make the return journey, and passing beneath Tromsø’s bridge was a milestone to be celebrated. It feels wonderful to have completed that section, one third of the journey to Bergen, over 450 miles under the bows. Two TV channels and the local paper shared our story the next day, which ensured the waves we received once back on the water were of recognition, not amusement! 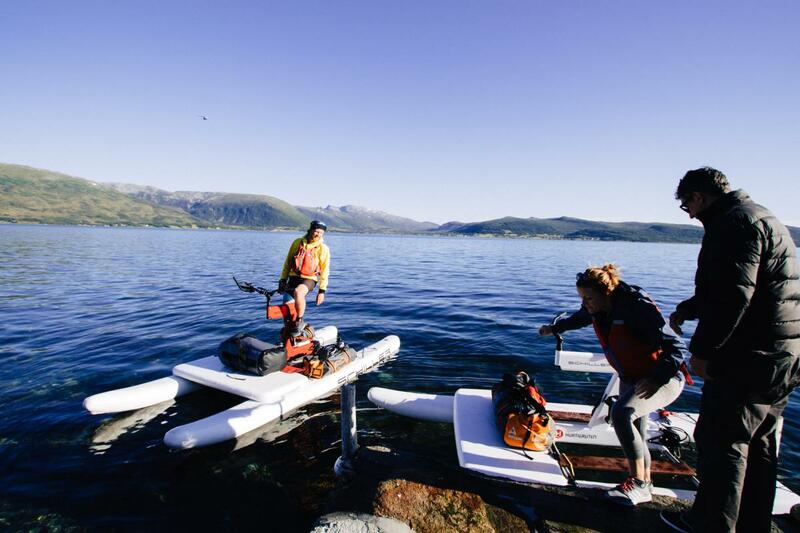 “Oh, you’re THAT guy!” said Ulrik, a 74 year-old resident of Vikran, a few miles south of Tromsø. We’d pedalled into a marina where he keeps his boat, and before we knew it he’d opened up the clubhouse and invited us to stay. 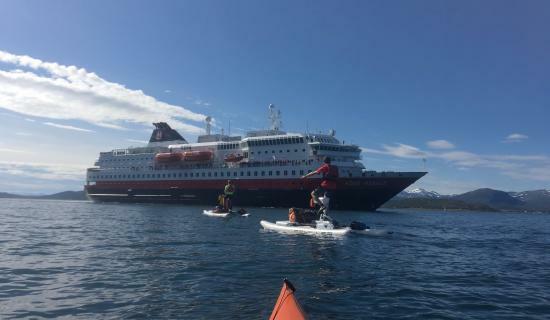 Andy and Chris joined me for the last three days before I took a week off the water to heal some blistered feet, and a few miles north of Finnsnes, on a beautiful flat calm day with winds to our tail and sun blazing down, the MS Kong Harald came into sight. This time though we met mid fjord, and the Kong Harald came to a stop, right there. Hundreds of passengers were out on deck, waving flags and cheering down to us. The whole ship was visibly leaning to the right and we couldn’t believe it! The captain and staff up on deck waved down, saluted and took photos, and behind me Andy was wiping his eyes with emotion. 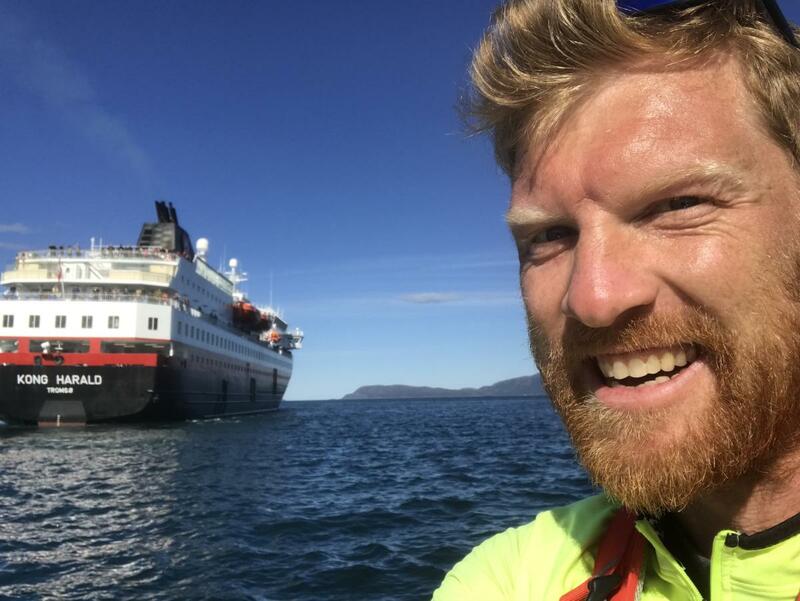 Well, that set me off, and there we were, tears dripping down our cheeks at the kindness of all these people, making us feel like part of the Hurtigruten fleet despite our minimal size. That moment will stay with me forever. And now, as you read this I’ll be back on the water, heading south, collecting more memories, Hurtigruten’s smallest craft slowly but surely making its way towards Bergen. See where Dave is right now and more background information about this trip. Also read Dave&apos;s first and second blog posts.